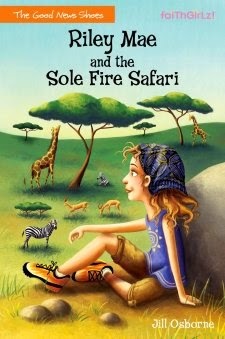 Book 3 of the "Good News Shoes" series follows Riley Mae and her friends on another great adventure -- this time to the other side of the world -- to Africa! "Riley Mae and the Sole Fire Safari" by Jill Osborne is the 3rd book of a series that should be read in order to be fully enjoyed. With the African setting, Riley is faced with different challenges, but the themes are still close to home. The theme of prayer and God not always answering in the way we expect is revisited. Riley has a bit of a bad attitude about being in Africa at first -- especially when she has to eat strange food and wake up incredibly early in the morning. Despite her prayers to get back home, Riley finds God has a different plan for her. Part of God's plan is for Riley to think about what she wants to be when she grows up. Faith, Riley's friend who is a Kenyan native, has a strong commitment to education and is sure of what God has called her to do with her life. Faith inspires Riley to find out what God has called her to do and to trust that God will guide her. The importance of sharing the gospel (even though you feel afraid) is readdressed. In this book, Riley has the opportunity to tell the good news to a young, Kenyan orphan. One thing worth mentioning is the extra emphasis on Riley's crush, Sean, in this book. She writes a letter to him that she doesn't intend to send saying: "I hope you don't "like" her like you "like" me." and even talks about marriage as a possibility in the future. Sean comes up a few more times in the book -- for example when Riley's friends say they are praying for her and Sean to get together. This seems a bit of a jump from the previous two books which talked about doughnuts more than serious feelings. This book will inspire soft hearted reader to think about things globally -- topics like elephant and rhino poachers; the accessibility of clean water; and the availability of quality education for those in other countries. The threat for young girls in Kenya of being kidnapped and taken for wives is also addressed. Riley and her friends will once again encourage pre-teens to have a closer walk with God; to focus on prayer; and to consider His plan for their lives. And, of course, there's the added bonus of reading about adventure and mystery against an African backdrop!